Today we celebrate the feast of one of Christ's chosen apostles, and extol him as the father of all those called by Christ's name, and in particular as patriarch of those "which were born, not of blood, nor of the will of the flesh, nor of the will of man, but of God" (John 1:13). 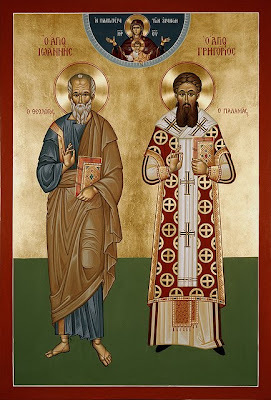 But even this John has in common with Peter and James, Christ's foremost disciples, just as he shares his role of evangelist with his fellow writers of the Holy Gospel, the words of eternal life, though he far surpassed them in his eloquence and sublime theology. Christ was the beloved Son, John was the beloved disciple. Christ was in the bosom of the Father, John leant on Jesus' breast. Christ was a virgin, and by His grace, so was John. Christ was the Son of the Virgin, and so was John. "The Lord thundered from the heavens" (Ps. 18:13), and John was thunder, for he, more than the others, was called thunder and the son of thunder (c.f. Mark 3:17), a most theological thunder which resounds to the ends of the earth declaring the divine truth that in the beginning was the Word from the Father, and the Word was with God, and was God, and in Him was life and the true light, which lights every man coming into the world, by Whom in the beginning all things were made. The beloved disciple was sent by our Savior Jesus Christ, who loved him, to teach us the whole truth, raise us up from these dead works, and urge us towards works of light. He made perfectly clear that love for God and our neighbor was the culmination of these works, and capable of bringing salvation. How can we fail to love and honor him as the one who disclosed to us the truth in its entirety? So let us not, brethren, do the opposite of what he has told us. And let us not show love and faith in our speech and gestures, while disobeying him in our actions, as John himself forbade, saying, "Brethren, let us not love in word, neither in tongue; but in deed and in truth" (1 John 3:18). From "Homily On St. John the Evangelist and Theologian" in On The Saints: Sermons by Saint Gregory Palamas (Mount Thabor Publishing).